Various ways to get here, probably the easiest is by taking the A639 north from Bolton, up to Turton & Entwhistle Reservoir. Park up in the layby and walk onto the hills behind you (south), right near the very top. Look around! 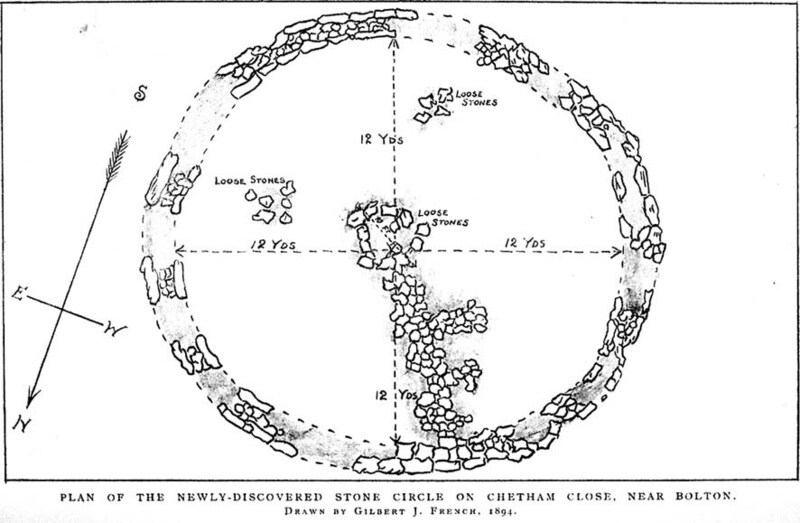 From time immemorial the existence of a so-called Druidical circle upon the top of Chetham’s Close has been recognised, and at one time the monuments of this circle must have been very pronounced and prominent. Within the last quarter of a century, however, the stones have been sadly mutilated and in part destroyed. This was chiefly done by the tenant farmer of the late owner, Mr. James Kay, who objected to people visiting the situation. Mr. Kay was communicated with, but did little or nothing to prevent the mutilation. I am glad to say that the present owner has expressed his intention of faithfully restoring and protecting the circle, and by the aid of the plan taken in 1871 by Mr. Thomas Greenhalgh, of Thornydikes, near Bolton, will have little trouble in doing so. “In the parish of Bolton-le- Moors is a hill named Turton Heights, and on the south-east end of it is a large sheep pasture, which goes by the name of Chetham’s Close. Nearly on the summit of this close, but inclining to the north-east, are the remains of a bardic temple, the diameter of which is about seventeen yards. There are only six stones of the circle remaining, and these are sorely mutilated either by time or the hand of man. The circle is as perfect as if traced by the compasses of Newton or La Place; and, what is rather singular, an upright stone stands about thirty-seven yards nearly east from its outward verge and another about seventeen yards due south. The ‘maen gorsedd’ has disappeared as well as some other stones forming the circle, and, from the oozy nature of the ground, I am inclined to believe that independent of the mutilations mentioned, the surface of the earth has risen considerably since the circle was first constructed. The views to the north and east are very fine, but bounded by hills rising and swelling above each other. Towards the south and south-east are seen Bolton and Manchester, with their busy populations; a considerable part of fertile Cheshire, Mow Hill in Staffordshire, and lofty ranges of mountains both in Derbyshire and Yorkshire; and were it not for Edgar¹ or Winter Hill on the west Penmaenmawr frowning upon the sea, Moel y Vammeau, and the bicapitated head of Snowdon would be distinctly visible on a clear day. Thus ends this chronicler, and his testimony is useful as corroborating that of subsequent generations. “The township of Turton, like many others in southwest Lancashire, is largely occupied by lofty moorland hills the home of the grouse and the lapwing. Amongst these wilds is a range of high ground standing more distinct from the other moors than is usual with hills of this nature. The range is divided into two parts by a slight depression. That portion to the north is named Turton Heights, and is stated by the Ordnance Survey to be one thousand one hundred feet above the sea. The southern half is known as Chetham Close, from its having been the property of that old Lancashire worthy, Humphrey Chetham. This part is twenty-five feet lower than Turton Heights, and the depression spoken of above sinks about thirty feet lower still. The summit of each is a sort of table-land, sloping gently towards the depression just named, and extending both together about a mile from north to south by a quarter of a mile from east to west. “Nearly in the centre of the northerly slope of Chetham Close and at an elevation of one thousand and sixty feet stand several stones of a Druidical circle. This circle, I should judge, originally consisted of eleven stones. Of these seven are still standing in a more or less perfect state. The diameter of the circle is small, being only fifty-one feet six inches. So the stones are, as might be expected, small likewise. The tallest is fifty-five inches by eighteen inches wide, and the shortest (number four) eight inches only in height. At the distance of forty-five feet, south-west from the outside of the circle, stands a solitary stone, nineteen inches high by ten inches wide, and southsouth-east at a distance of one hundred and two feet another stone, thirty-five inches high by seventeen inches wide. The stones vary in thickness from nine inches to fifteen inches. “The position of the stones is circular, with vacant spots, and their dimensions and shapes vary. The table-land gradually rises from the circle in a southsouth-east direction and a short distance past the outlying stone a height of one thousand and seventy-five feet is attained, and a quarter of a mile further on a view is to be got, with a clear atmosphere, which towards the south is bounded only by the powers of vision. From this spot the ancient people who erected the circle must have often gazed on a scene which persons now familiar with south Lancashire would find it impossible to realise. The valleys and even the sides of the hills were clothed with trees, the oak and birch predominating, whilst the margins of the numerous streams and swamps were overhung by the alder; the wild boar and doubtless the wolf roamed in the woods, and smaller game abounded in the more open parts. The numerous waters throughout the district would be alive with fish, amongst which the salmon might be numbered; for when the country was better wooded and entirely uncultivated the large rainfall of the district (now about a mean of fifty-five inches) would be still more copious, and keep the streams full of water. “The last few centuries have, however, wrought a wonderful change in the scene, which has been the most rapid since the introduction of machinery into the country; and from the same spot may now be seen the habitations, comprised in towns, villages, and farmhouses, of hundreds of thousands of human beings. Unfortunately, however, there are still to be found amongst us persons as barbarous in some respects as the rude people who erected the circle. These were rude in their ideas of building; the others barbarous in wantonly destroying that which time had made more interesting than the palaces of kings. Up to the spring of last year the circle appeared to have suffered little for ages; but at that time rambling over the moors I turned aside to take another look at the circle. Not that I thought of anything having happened, but for old acquaintance sake; when to my surprise I noticed a framework of wood within the circle, and upon reaching the spot itself what my disgust and astonishment were may be easily imagined, when I found two of the stones broken almost to fragments, and several others damaged. This could only have been effected by the aid of a heavy hammer, as the stories broken were before strong and sound. Fortunately, they were not rooted up so their places are still seen in the group. One very small one has apparently been in the state it now is for a long time. “I at once communicated my unpleasant discovery to the owner of the land, James Kay, Esq., of Turton Tower, who instituted an enquiry, and traced it to some members of a picnic party, who had made use of the ground without asking leave. A few more such wanton pieces of mischief, and this interesting relic, like many others of its class, will be irrecoverably destroyed. I have no doubt that the British celt referred to in this account by Mr. Greenhalgh is the same as that mentioned in the previous description by ‘Elvaeliad,’ and I conjecture that this is the nom de guerre of the same Rev. William Probert referred to, who was a literary man, and the author of Ancient Laws of Cambria (1823) and other works. I am glad to say that this celt was kindly given up by the authorities of Manchester New College, and has been placed in the Chadwick Museum, Bolton. It is also interesting to note that a similar specimen was found in a quarry on Cockey Moor, near Ainsworth, about three miles from and in view of the circle, by Dr. Denham, about 1839. It is still in the possession of his family. 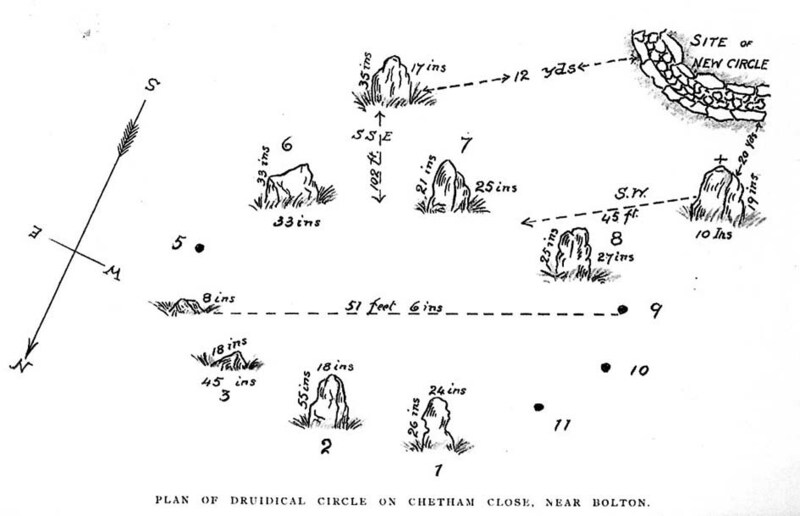 It has long been supposed that this circle of upright stones was the only one on the site; indeed, the late Mr. Scholes, in his recently published History of Bolton (1892, p.11), says only one circle is known about Bolton. In June of last year, in company with Mr. Thomas Hardcastle, I visited the site, and noticed what was evidently another circle. This we perceived from the stones cropping up in places and from the nature of the turf. I find that the same opinion was formed by a member of the Manchester Literary Club (the late Mr. E. Kirk), who, in a paper read before the club, in November, 1878, says: “There are two circles, the more northerly formed of large individual stones, set diadem or corona fashion, the other of smaller stones, as if it had been a walled enclosure with a pile in the centre.” This observation is quite correct, and a removal of the surface of the earth last June to a depth of three to six inches revealed a perfect stone-walled circle, as shown in the illustration. This circle is larger than the upright one, being exactly twenty-four yards across (the size of similar stone circles, ex. gr., the circle at Zennor, Cornwall). It lies to the south-west of the upright circle and is twenty yards from the outlying westerly stone of same, and is twelve yards from the outlying southerly stone of same, and is on slightly higher ground than the first circle. The circle is faced on both inside and outside by large flat stones, and the space within is occupied by smaller stones. I can find no trace of mortar nor marks of tools, nor do I find any gateway or opening to the circle, although the whole of it has not yet been laid bare. The circling wall is of an average width or thickness of four feet. The stones are the ordinary grit stone of the district. The removal of part of the earth within the circle has shown a number of stones lying there and there is also a large collection in the exact centre. It is most symmetrically round, and the wall is very evenly and regularly constructed. I think there is no doubt but that it is of later date than the upright circle and may have been subsequently used as a place of worship. Possibly it may, in accordance with the theory of Dr. Colley March, have been a place for mortuary exposure before subsequent sepulture, and it is interesting to note that the Three Lowes in the valley below and about half a mile away are reputed Barrows. No bones or remains of any sort have yet been found, but so far only the upper surface lies exposed. Its situation and shape preclude the idea of its being a sheep-fold, and from its dimensions it is not likely to have been a watch tower or a “burgh.” Possibly it may be the site of a collection of ancient British dwellings, clustered together, and defended by the enclosing wall. The owner, Mr. Hardcastle, intends to make careful excavations, and from these some further information and enlightenment will probably be thrown upon the origin of what is undoubtedly a most interesting and important archaeological discovery. 1. This is evidently the origin of the name of the adjacent township, “Egerton.” I have seen the place, “Edgar’s town,” marked in (fifteenth century) Lancashire maps. 2. Now the Manchester College, Oxford (Unitarian). Dixon, John, Journeys through Brigantia – volume 11: East Lancashire Pennines, Aussteiger Publications: Barnoldswick 2003. This entry was posted in Brigantia (Northern England), Lancashire, Stone Circles and tagged antiquarian, antiquities, Archaeology, Bolton, Bronze Age, cairn circle, cairns, earth mysteries, Egerton, enclosure, heritage, Lancashire, megalithic, Megaliths, Pennines, prehistoric sites, sacred sites, Stone Circles, Turton. Bookmark the permalink. See JOURNEYS THROUGH BRIGANTIA Vol 11, – ‘The East Lancashire Pennines, John Dixon & Jaana Jarvinen, 2003 AUSSTEIGER. ISBN 1-872764-07-X. pp. 88-90. for more information. In 1954 a Bronze Age? saddle quern was found 80m NE of the stone circle and a further outlier was found to the NW of the ring-bank cairn. A further small cairn was located 30m SE of the said cairn and another small cairn NE of the circle. Another ring-bank carn has been located 700m SE of the triangulation point. It is partially overlain by a stone wall and in a ruinous condition, yet sections of the massive rubble cairn can be distinguished, and a large earthfast boulder near the centre may be an integral feature. I am indebted to M. Fletcher who gave me access to his 1990’s survey work on the above sites. The Lancashire’s Sacred Landscapes book, edited by Linda Sever, is now advertised on Amazon and available to pre-order at £12.99 with a publication date of the 1st Feb!